Jose Maria Olazabal, Paul McGinley, Miguel Angel Jimenez and Darren Clarke at Medinah. Photo Eoin Clarke/www.golffile.ieBetting for the 2014 European Ryder Cup captaincy is in full swing with Darren Clarke and Paul McGinley the leading candidates for the job at Gleneagles, according to the bookies. Who would you like to see get the job? Who should captain the 2014 European Ryder Cup team? 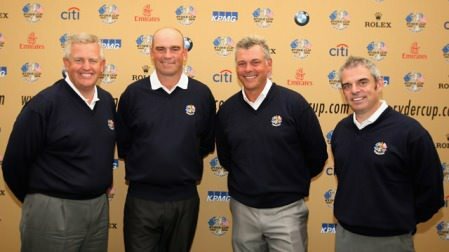 Colin Montgomerie, Thomas Bjorn, Darren Clarke and Paul McGinley will be at the epicentre of Europe’s Ryder Cup captaincy debate next week. But could another name emerge at the last minute?Europe will almost certainly name its 2014 Ryder Cup captain next week as the European Tour moves to put a man in place and begin the search for sponsors for what could be a challenging staging at Gleneagles. According to sources close to the European Tour, the powers at Wentworth are keen to delay no longer and get the marketing campaign up and running and appoint the man to do battle with Tom Watson, who the Americans appointed last month as the man best equipped to wrest back the trophy in Scotland in 625 days’ time. Talk that the decision could be put off for a month is no longer on the agenda but while it appears clear which candidate or candidates will be at the centre of discussions when the Tournament Players Committee sits down in Abu Dubai next Tuesday, no-one is ruling out a surprise. Will Clarke really bow out of Ryder Cup race? 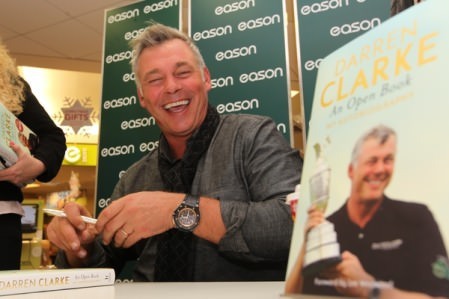 Darren Clarke signs copies of his autobiography in Eason’s in December. 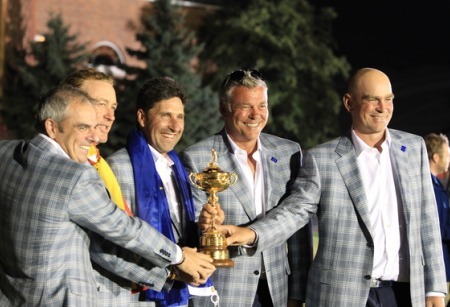 Picture Fran Caffrey/www.golffile.ieIs Darren Clarke really thinking of bowing out of the race for the 2014 Ryder Cup captaincy?